HuntQuery.com is the PUP that uses misleading techniques to prevent removal. Use Reimage to locate malicious components and get rid of them faster than with uninstall instructions. A full system scan blocks virus reappearance and prevents traffic to malicious domains. Should you remove HuntQuery.com from your browser? How did this PUP manage to hijack your browser? 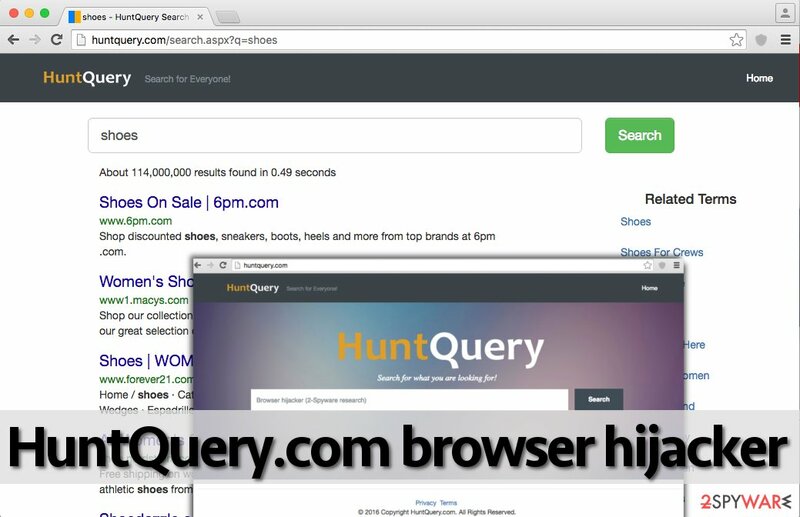 How to remove HuntQuery.com browser hijacker? HuntQuery.com virus, which is also known as HuntQuery.com redirect virus, is a potentially unwanted program (PUP). If a user installs it on a computer, he/she will notice an identically named website in their browsers (Mozilla, IE, or Chrome) each time they launch them or open new windows or tabs in them. However, this PUP can also hijack the computer without user’s knowledge as well, and that is why some computer users think that it is a virus. However, it is not malicious itself, but the website that it sets as homepage and new tab page is definitely not a secure one, and we can say the same thing about HuntQuery search engine as well. You should also think before clicking on intrusive pop-up ads, links, and other clickable content. Such content can be deceptive, especially if it comes from the website that you were redirected to. In a nutshell, you should not interact with unknown web pages if you do not know if they are reliable or not. However, there’s something more that we would like to mention. 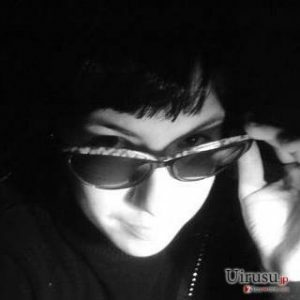 This hijacker can also spy on user’s activity on the Internet and see his/hers latest search queries, the list of recently visited websites, also computer’s geolocation, IP address, and similar information. It claims that it uses such information to deliver more relevant ads and search results, however, you should decide if you want to reveal such information and receive targeted ads because users who also use your computer will be able to see what you are interested in. If you do not want to let this program track your browsing habits, remove HuntQuery.com from your PC. You can use instructions given beneath this post or initiate HuntQuery.com removal with an anti-spyware program like Reimage. If you do not want your PC to be infected with PUPs or critical programs, you have to take care of it and perform regular system scans with an anti-spyware program. If you do not have one and if you do not plan to obtain one in the near future, then you can try to remove HuntQuery.com virus and other suspicious programs manually. Our spyware researchers have prepared these comprehensive HuntQuery.com removal instructions for you – use them to eliminate this and other vague applications from your PC. Here, look for HuntQuery.com or any other recently installed suspicious programs. Wait until you see Applications folder and look for HuntQuery.com or any other suspicious programs on it. Now right click on every of such entries and select Move to Trash. When in the new window, check Delete personal settings and select Reset again to complete HuntQuery.com removal. Once these steps are finished, HuntQuery.com should be removed from your Microsoft Edge browser. Here, select HuntQuery.com and other questionable plugins. Click Remove to delete these entries. Now you will see Reset Firefox to its default state message with Reset Firefox button. Click this button for several times and complete HuntQuery.com removal. Here, select HuntQuery.com and other malicious plugins and select trash icon to delete these entries. Click Reset to confirm this action and complete HuntQuery.com removal. Here, select Extensions and look for HuntQuery.com or other suspicious entries. Click on the Uninstall button to get rid each of them. Here, look at the Homepage field. If it was altered by HuntQuery.com, remove unwanted link and enter the one that you want to use for your searches. Remember to include the "http://" before typing in the address of the page. Now you will see a detailed dialog window filled with reset options. All of those options are usually checked, but you can specify which of them you want to reset. Click the Reset button to complete HuntQuery.com removal process. This entry was posted on 2016-07-01 at 02:38 and is filed under Stealing programs, Viruses. You can quickly scan the QR code with your mobile device and have HuntQuery.com virus manual removal instructions right in your pocket. How did you remove HuntQuery.com virus?